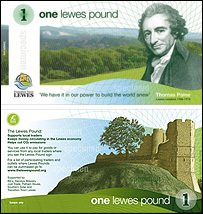 Lewes in East Sussex has introduced its own trading currency - the Lewes Pound. But will this alternative money help it to survive the recession? Will this bold move catch on elsewhere..? As the recession works its way through the economy, many communities are looking for ways to work together to support each other. There are a range of strategies for achieving such local solidarity. 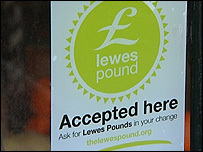 But the Lewes Pound, launched in September 2008, has received more publicity than most. One Lewes Pound is equivalent to one pound Sterling. The notes bear the picture of the 18th Century intellectual, Thomas Paine and on the reverse, is a depiction of the town. They can be bought at various places in the town, and can be used to pay for goods at over 130 local shops and pubs and they are given in change too. Local supporters say that since its launch, the Lewes Pound has provided a short-term boost to the economy. 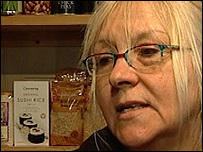 One local shopkeeper, Susan May, says that use of the pound has actually grown, not tailed off. She says that she accepts a steady stream of Lewes Pounds in her shop, sometimes accounting for as much as 10% of a day's takings. For Susan, the scheme's benefits lie in the fact that it inspires loyalty to the town: locals are less likely to shop in Tesco, she claims, and will stick with the local retailers. In order to entice people to use Lewes pounds rather than Sterling, several shops are offering discounts to people who pay with local money. At Lewes' Harvey's Brewery, you can get a bottle of beer for £1 instead of the usual £1.10 if you use the local currency. The scheme's organisers, the Lewes Pound Group, are also looking at how best to develop, to ensure that it delivers the benefits that they claim for it during the recession. Oliver Dudok van Heel of the Lewes Pound Group says that they are considering issuing the pounds in higher denominations to make transactions easier, and setting up a local bank or credit union. He rejects the claim that they are being isolationist, insisting that it is a matter of building Lewes' resilience from the economic challenges ahead, while strengthening community spirit. But the Lewes Pound has its critics too. The pounds are not legal tender and can be exchanged for sterling at any point, which can of course, then be used anywhere, so there is nothing to actually guarantee that the cash stays in the local economy. Sceptics wonder why retailers do not simply offer discounts to all customers, not just those holding Lewes Pounds, if they want to make themselves more competitive during a recession. They also point to similar schemes across the world which have eventually collapsed. According to the critics, the scheme is a useful PR gimmick, but little more than that. Whatever the merits of the Lewes Pound, it raises the question of whether or not communities should be sticking together and trading within their own boundaries, or remain focused on the bottom line - seeking the best deals for themselves or their businesses - wherever those deals might be found.